Renewable Energy Policy Convergence in the EU - The Evolution of Feed-in Tariffs in Germany, Spain and France by German academic David Jacobs is the most current and up-to-date review of renewable energy policy among Europe’s three leading users of feed-in tariffs. Jacobs is a Research Associate at the Environmental Policy Research Center (FFU), Freie Universität Berlin, Germany and is one of a handful of experts on feed-in tariffs worldwide. He, along with Toby Couture and Wilson Rickerson, are probably the three leading theorists of the renewable energy policy we now call feed-in tariffs. Like Couture and Rickerson, we’ll be hearing more from Jacobs in the future as his work begins to get wider circulation. The book grew out of Jacobs’ doctoral research the thrust of which is the theoretical underpinnings of what’s called “policy convergence” and his exploration of how and why feed-in tariff policies in the three target countries appear to be converging. No short review can ever do justice to a 312 page book replete with citations, references, and footnotes. Most of us use books to search out ideas, facts, or observations on topics that most concern us. And that’s how I approached Jacobs’ book. I focused on what interested me most: the fascinating account of how neoliberal economists in Brussels tried to force usage of the quota model across Europe through so-called “harmonization” of renewable energy policies. While there are numerous policies used for developing renewable energy, nearly all fall into two great classes: quota systems, and price systems. In quota systems, the government sets a target or obligation on utilities for a certain amount of renewable energy, but doesn’t directly determine the price. In North America, quota systems go by various names, such as Renewable Portfolio Standards, Renewable Energy Standards, and so on. In price systems, the government may have a target but instead of saying how much renewables must be built every year, it instead determines the price that renewables will be paid and let’s the market determine the volume installed. This policy is know as renewable tariffs, feed-in tariffs, or simply feed laws because they allow owners of renewable generation to “feed” electricity into the grid and get paid for it. Despite all the evidence to the contrary, economists at the European Commission in Brussels have continued to argue that universal adoption of a quota system across the European Union (EU) would be better both for renewables and the economy. Jacobs recounts each attempt that “Brussels,” shorthand for the Commission’s staff and policy leaders, has made to force harmonization of renewable policy by eliminating feed-in tariff programs because they don’t nicely fit within the neoliberal conception of the European marketplace. The Commission went so far as to attack Germany’s feed-in tariff policy specifically. I remember this period well. Various trade associations were lining up on either side of the ideological divide, trying to find a position most advantageous to their members. The world wind industry split apart over what would be the future of renewable energy policy, leading to the formation of two global trade associations. The World Wind Energy Association, first off the mark, was launched by continental European advocates of feed-in tariffs and the transparency and democratizing effect FITs have on electricity generation. The Global Wind Energy Council was formed by the large manufacturers, utility companies, and those of the English-speaking world who believed that quotas were the only policy compatible with the “free” markets that would enable them to dominate the industry. The supporters of the Global Wind Energy Council argued, for example, that quota systems were “inevitable” as though quota mechanisms were a natural evolutionary step on the path to renewable energy policy nirvana. From 1999 to 2009, the Commission staff made two attempts at forcing harmonization, or universal adoption of the quota model. Both failed. Following its first failed attempt in 2001, the Commission focused its subsequent research on comparing the results between different support systems. The belief may have been to convince wayward states using feed-in tariffs, such as Germany, the error of their ways by showing them the data that proved quota systems were more beneficial. The Commission erred again. Even though most analysts focused only on the economic aspects of feed-in tariffs and quota models and not on non-economic factors, such as transparency and local ownership, the results were startling--in part because they were coming from Brussels. In a now famous 2005 study, Commission researchers concluded that “well-adapted feed-in tariff regimes are generally the most efficient and effective support schemes for promoting renewable electricity.” See European Commission: The support of electricity from renewable energy sources. The Commission’s studies showed, for example, that the only states on track to meet their EU renewables targets were countries using feed-in tariffs. More damning for neoliberal economists at the Commission, however, were the findings that feed-in tariff policies were both more effective, that is, produced more renewable energy, but also—contrary to theory--far less expensive. Fortunately, members of the European Parliament countered the ideological proposals from the Commission and, in turn, suggested that if renewable energy policies were to be harmonized they should be based on a “purchase obligation and a minimum payment,” in other words, feed-in tariff policy and not a quota system at all. Currently EU member states are still free to choose which policy or “support” instrument they prefer to increase the share of renewables in the power system. Jacobs notes that the majority of the 25 countries in the EU use feed-in tariffs. More telling is that many of the stalwart ideological proponents of quota systems have themselves moved to feed-in tariffs. Britain has adopted FITs for small power producers and is on track to substitute a price mechanism for its Renewable Obligation, a form of Renewable Portfolio Standard. Similarly, Italy adopted a FIT for solar photovoltaics and has since moved the remainder of its renewable program to feed-in tariffs. Of significance here is Jacob’s use of the neutral world “support” instead of the politically charged word “subsidy” or somewhat less charged “incentive”. Jacobs’ usage shows his command of the political subtleties of English. (Other writers on the same topic are much less careful than Jacobs.) Thus, Renewable Energy Policy Convergence in the EU, is Jacobs’ analysis of renewable energy “support systems”. In so doing, Jacobs makes clear that Renewable Portfolio Standards, feed-in tariffs, and tendering or bidding systems are all “support systems” regardless what the proponents of each may think. Equally important, Jacobs points out that the Commission itself classifies both policies as “market instruments” something that economic theorists have yet to do in the US. Many American writers continue to erroneously label German feed-in tariffs “subsidies” or “incentives”. Another example of the real world interacting with theory of how it should behave is Jacobs observation that though we might think that a policy emanating from Brussels would lead to harmonization of policies on renewable energy across Europe that hasn’t been the case. National self interest has led to a “patchwork” of policies despite what Brussels might prefer. The parallels with the US are noteworthy. Though the US constitution limits what states can do regarding electricity in commerce, state renewable energy policy varies widely depending upon local self interest and local legal interpretation of federal laws. I’ve often characterized US renewable energy policies that result as a “hodgepodge” of stratagems. Jacobs also includes a valuable discussion on how specific tariffs are determined. That this is a topic that truly frightens American regulators and their staffs might surprise German policymakers—politicians and their staffs--who regularly wade into the nuts and bolts of pricing. Jacobs explains how it’s done in Germany and notes that as a transparent public process the final tariffs are determined politically by parliamentarians. In Germany, parliamentarians assume final responsibility for setting the price and all the consequences that entails. Of interest for us in North America, is Jacobs historical account of how the first tariffs were determined in Germany and how the strategy used was later abandoned. Like Americans in the 1980s and 1990s, Germans were fixated on “avoided cost” and the original German feed law based payments on the avoided cost of generation plus an approximate payment for renewable energy’s environmental benefits. Many in the US renewable energy community continue to insist, even some of those pursuing feed-in tariffs, that if they just get the “value” right, renewables will miraculously appear. Unlike in North America, however, Germans learned quickly that a “value-based” approach to pricing would never pay enough to make solar profitable. It was this observation that led to local solar activists to demand cost-covering remuneration (kostendeckende Vergütung in German). This is what we now call cost-based pricing and was introduced in Germany with the Renewable Energy Sources Act in 2000. Jacobs explains that this was led from the ground up by communities, such as Aachen, Freising, and Hammelberg. The latter is the home of German politician Hans-Josef Fell who along with his colleague Hermann Scheer were the authors of Germany’s now famous renewable energy law. The lessons from Aachen and Hammelberg need to be heard in the US, particularly among politicians and regulators. Jacobs’ book can teach us much about how these lessons were learned in Europe, how the ideological fight between quota and price systems were engaged, and how many of the issues that bedevil us here were overcome. 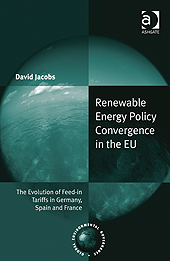 Renewable Energy Policy Convergence in the EU - The Evolution of Feed-in Tariffs in Germany, Spain and France by David Jacobs, Ashgate, 234 x 156 mm, July 2012, 312 pages, ISBN: 978-1-4094-3909-7, $99.95. This title is also available as an eBook, eISBN 978-1-4094-3910-3. Renewable Energy Policy Convergence in the EU joins two other books useful in understand feed-in tariffs, both the theory behind them and how they’ve actually performed: Powering the Green Economy: The Feed-in Tariff Handbook (2010), and Miguel Mendonça’s simply titled Feed-in Tariffs (2007).